There are well over two-dozen VPN services in the market, and each claiming to be the best. There’s a well-known list of top VPN services that have established themselves as the best in the business. Customers usually rotate their preferences between these options, because frankly, new VPNs can’t quite keep up with the quality, reliability, and the number of features these established VPN services have to offer. Which is why FastestVPN caught our attention. Emerging just last year in the VPN space, this VPN service has amassed a strong number of positive reviews. FastestVPN hails from the Cayman Islands. It’s a British Overseas Territory, that means it’s autonomous in governance. Because of its autonomous nature, FastestVPN can operate without the influence of the government, particularly the Five Eyes alliance. It’s an alliance of five countries that serves only one purpose: spy on people and share communications intelligence. The region in which a VPN service operates is an important factor because that determines how much freedom it has. One of the primary uses of a VPN is to secure our internet sessions. VPNs use encryption technology to secure data flowing in and out of the device. Encryption is a method of scrambling data in an unreadable format which could only be deciphered using a unique key. FastestVPN utilizes AES 256-bit encryption technology which is trusted by security experts around the world. It is also engineered to prevent DNS/IP leak. And in the event connection to the VPN is dropped, Kill Switch feature terminates internet connectivity to prevent IP leak. On top of that, FastestVPN ensures that you have a reliable and consistent browsing experience by utilizing Anti-Malware protection, NAT firewall, and Ad-Blocker. FastestVPN boasts a network of more than 150 high-speed servers around the world. These high-speed servers are also P2P-optimized. What that means is that you get absolutely the best speeds while torrenting. Not many VPNs will let you torrent and also provide fast download speeds. Global coverage is an important factor to look for in a VPN. It determines how many geographic locations you can spoof at will. The number of servers per regions mean that performance will not get bogged down in the event of high traffic. What worth is a VPN if it doesn’t work on your preferred device? Luckily, FastestVPN demand no such reservations on your part. It has an impressive compatibility with more than 20+ devices. The list of devices include platforms like Linux, Roku, Chromecast, video-game consoles like Xbox and PS4, and Routers. FastestVPN has dedicated apps for Wndows, macOS, Android, and iOS. These apps are simple to use and come preconfigured out-of-the-box. Simply download the app for your device, run the installation, launch the app, and start using it. When it comes to pricing, FastestVPN doesn’t hold back in delivering value to customers. If you’re looking for best VPN features that don’t put a dent on your wallet then look no further. At the time of writing this article, FastestVPN is running an incredible sale on its website. With a 92% discount, you can avail 5 years of FastestVPN for $49.95. One subscription grants the ability to connect up to 5 devices simultaneously. A Virtual Private Network (VPN) is a tool to protect your identity and data online. It’s a tool to provide you with privacy. In a normal scenario, every internet request is handled by the ISP (Internet Service Provider). It puts your online activity at the mercy of the ISP. It may decide to take a peek, or worse, maintain logs of your online activities. Think of everything you do on the internet being recorded on the ISP’s servers. VPN establishes connection between your device and its server. It assumes responsibility of fulfilling those internet requests. It grants you a private IP address so that you can spoof your location and identity online. A reliable VPN is a fortress against unwanted traffic and intrusions. And because you can spoof your location at will, a VPN is also used to bypass geo-restriction. It lets you get around website and content banned by the government. 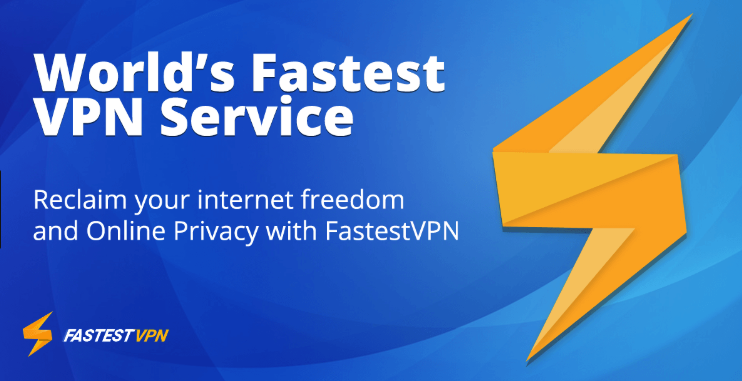 FastestVPN has the makings of a strong competitor in the VPN space. It’s got the security, the features, and the value to make a name for itself. The VPN service was able to deliver on our expectation and we were left impressed. FastestVPN offers 24/7 customer support to help you with any problems you may have. Although there’s no free-trial, the 7-day money-back guarantee gives you plenty of time to take the VPN for a test drive. But judging from our experience, It’s unlikely you’ll be dissatisfied with the service.